No matter what your actual job title, you are-or soon will be-a data worker. Every day, at work, home, and school, we are bombarded with vast amounts of free data collected and shared by everyone and everything from our co-workers to our calorie counters. In this highly anticipated follow-up to The Functional Art-Alberto Cairo's foundational guide to understanding information graphics and visualization-the respected data visualization professor explains in clear terms how to work with data, discover the stories hidden within, and share those stories with the world in the form of charts, maps, and infographics. In The Truthful Art, Cairo transforms elementary principles of data and scientific reasoning into tools that you can use in daily life to interpret data sets and extract stories from them. 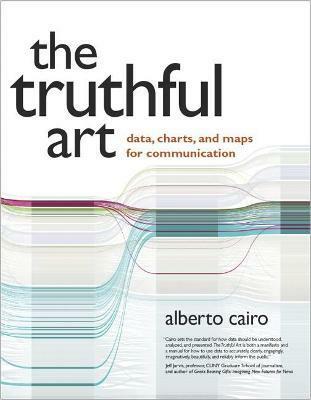 The Truthful Art is also packed with inspirational and educational real-world examples of data visualizations from such leading publications as The New York Times, The Wall Street Journal, Estado de S (c)o Paulo (Brazil), Berliner Morgenpost (Germany), and many more. "Alberto Cairo is widely acknowledged as journalism's preeminent data viz wiz. He is also journalism's preeminent data scholar. As newsrooms rush to embrace data journalism as a new tool-and toy-Cairo sets the standard for how data should be understood, analyzed, and presented. The Truthful Art is both a manifesto and a manual for how to use data to accurately, clearly, engagingly, imaginatively, beautifully, and reliably inform the public." "A feast for both the eyes and mind, Alberto Cairo's The Truthful Art deftly explores the science-and-art-of data visualization. The book is a must-read for scientists, educators, journalists, and just about anyone who cares about how to communicate effectively in the information age." - Michael E. Mann, Distinguished Professor, Penn State University and author of The Hockey Stick and the Climate Wars "If I were smarter, had more patience with academia, and had more focus, I might turn out to be more like Alberto, closer to the brilliance that he applies to the nature of information architecture. His title explains a lot: truth represents a most fundamental of attitudes, in questions asked, answers given and journeys taken. This [book] is a must on your thoughtful shelf of understanding." "Alberto Cairo is a great educator and an engaging storyteller. In The Truthful Art he takes us on a rich, informed, and well-visualized journey that depicts the process by which one scrutinizes data and represents information. The book synthesizes a lot of knowledge and carefully explains how to create effective visualizations with a focus on statistical principles. The Truthful Art will be incredibly useful to both practitioners and students, especially within the arts and humanities, such as those involved in data journalism and information design." "As soon as I started immersing myself in The Truthful Art, I was horrified (and somewhat ashamed) to realize how much I didn't know about data visualization. I've spent most of my career pursuing a more illustrative way to present data, but Alberto Cairo's clarifying prose superbly explained the finer points of data viz. Since Alberto warns us that "[data is] always noisy, dirty, and uncertain," everyone in this business had better read his book to find out how to properly construct visualizations that not only tell the truth, but also allow us to interact meaningfully with them." "To communicate data clearly, you have to think about it clearly. The Truthful Art dives deep and provides an enlightened introduction to the 'power tools' of data experts: science, statistics, and visualization." "The Truthful Art is essential reading for my visual communication students and for anyone (at any level) who cares about telling a story visually. Get this book, read it, act on it. If you're looking for help to put your data visualization on the right track, this is it." Alberto Cairo is the Knight Chair in Visual Journalism at the School of Communication of the University of Miami (UM), where he heads specializations in infographics and data visualization. He's also director of the visualization program of UM's Center for Computational Science, and Visualization Innovator-in-Residence at Univision. Cairo is the author of the books Infografia 2.0: Visualizacion interactiva de informacion en prensa, published exclusively in Spain in 2008, and The Functional Art: An Introduction to Information Graphics and Visualization (New Riders, 2012.) Over the past two decades, Cairo has been director of infographics and visualization at news organizations in Spain and Brazil, in addition to consulting with companies and educational institutions in more than 20 countries. You can find Cairo at www.thefunctionalart.com or on Twitter, where he is @albertocairo.